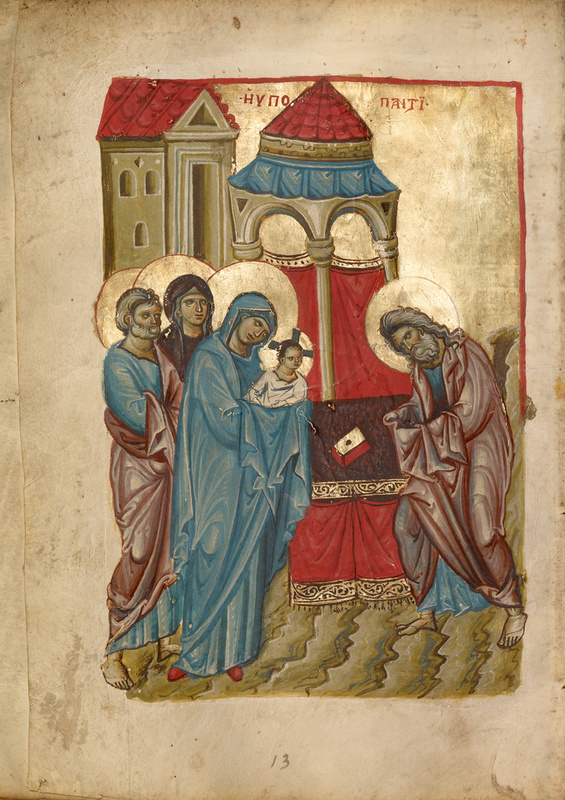 In this Byzantine Gospel book, the miniature of the Presentation in the Temple is placed in Saint Luke's Gospel, where the text describes the episode. It shows the Virgin Mary and her husband Joseph bringing the month-old baby Jesus to the temple. This event has been celebrated as a major church holiday, called Hypapante, in the Eastern Church since the fourth century; hence the Greek inscription above. In the miniature the Holy Family stands with Anna, an elderly prophetess. On the right, Simeon bows his head and leans toward them to take Jesus. A prophecy had foretold that Simeon, by this time very old, would see the Messiah before his death. The artist expressed Simeon's eagerness through the zigzag lines beneath his feet and his abrupt movement forward.